First of all, the title of this post is not hyperbolic. Your life does depend on it. In the U.S., it is all but impossible to live over the level of poverty without having some form of credit extended to you. Feel free to waste time trying to prove me wrong. Even if you succeed, you will quickly realize that the life you lead without any form of credit is not going to be an easy one. Part of the problem is that people fail to realize just how much credit they actually have. Even if you don’t have a traditional, unsecured credit card, the debit card from your bank is a type of credit. You can overdraw your account. Your bank will let you do that in a pinch. That is credit they are offering you for that particular situation. You can do the same with a check, though retailers are making that a bit more difficult. When you go to the hospital and tell them to bill you, you are taking on credit. When you buy a smartphone on a two-year contract, that’s credit. When you sign up for satellite TV, that usually comes with a two year agreement. That is credit. Whenever you get into a cab, or order a meal at a restaurant, and every other situation where you get service before payment is delivered, it is a type of credit. Your life as you know it depends on credit. Even if you appreciate the amount of credit you carry, you may not fully appreciate the role that credit plays in defining your particular way of life. If you have never been without good credit, you may have a hard time picturing what it is like on the wrong side of 600. You are no longer able to by the car you want. Don’t bother watching car commercials and reading car mags for info about your favorite make and model. You won’t be getting financed for that one. You will take whatever back-of-the-book beater they offer, at the terms they offer, and you’ll like it. Speaking of terms, your good credit buys you a nice car with no downpayment, and a low monthly rate. There is room to negotiate even better terms. With poor credit, you will pay more per month for a lesser vehicle, a lot more. You will have an upside-down loan on a vehicle you did not want. And you will consider yourself lucky that you got financed at all. Oh, you had better come with a hefty down-payment. You will find it even harder to buy furniture, appliances, a home, or any other big-ticket item. You will not have an unsecured credit card to hold you over till the end of the month. When you run out of money before your next pay day, you are really OUT OF MONEY! That changes everything about the way you budget, and the purchasing choices you make. Your good credit is your lifestyle. And you have to protect it that way. There are a number of ways your credit score can plummet. Unfortunately, people often do not realize that anything has gone awry with their credit until it is too late. It is usually at the point of sale when a routine credit check is being run that the problem is discovered. The good news is that there is a process for this eventuality. The process of repairing damaged credit is freely available to the public. That said, so is the ability to do your own taxes. You may have better results with professional assistance. There are a number of companies out there that offer this type of help. One of the ways to narrow down your options is to look at the social media messaging from the various companies. A good example is the creditrepair.com Facebook feed, which offers a useful stream of information for people with damaged credit. By evaluating what advice companies offer for free, you can get a good idea of whether their premium advice will serve your particular needs. Whether you get help or go it alone, you have to do something right away. Your credit report will not fix itself. The longer you wait, the more difficult it will be to remove negative items. You may not understand what these all mean. But rest assured; the criminals do. They have devoted their lives to learning how to easily steal what you have worked so hard to earn. What you lose in money is nothing compared to what you lose in good credit. By the time you realize that anything is wrong, your credit score may have already suffered. Stop clicking on stupid links, especially from a Windows PC. They mostly exist to steal your information. When you put in a PIN of any kind, in any device, cover it so that no one can see it. Legitimate services are not going to ask for personal information from an email. Don’t give it, even if the email is legit. The main thing you can do is just keep an eye on your credit score. The moment you see something suspicious, deal with it right away. Knowledge is power. Great information! 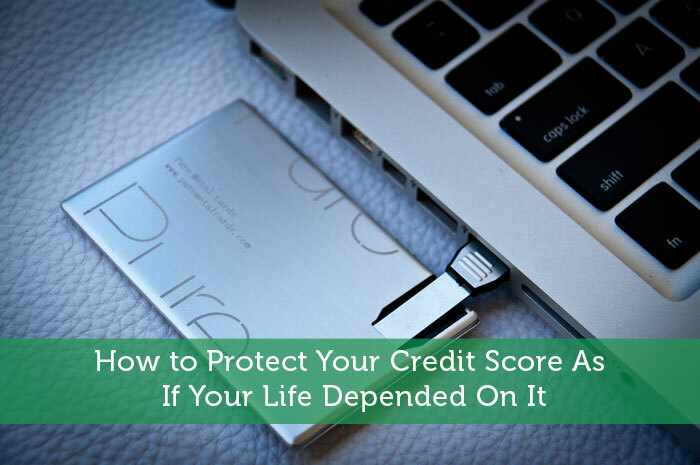 I love that you said to protect your credit as if your life depended on it – it is so true! It may be scary for some people, but making good choices when it comes to credit should always be a conscious effort. Thanks for sharing. Thanks for this one. Trust me there are many borrowers out there who are not even aware of the basic influence of credit scores on their financial future. This post is definitely going to be an eye-opener for them!